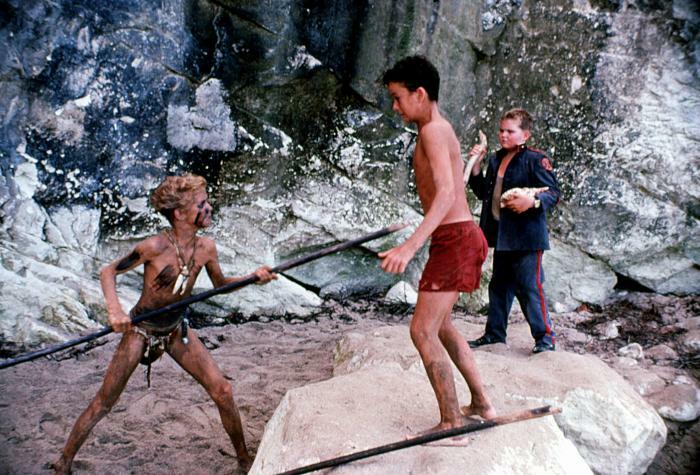 There’s more to Lord of the Flies than a group of upper-class boys stranded on an island. It’s an allegorical novel that contains a lot of symbolism that are too many to be told in one short book review like this. But here’s one certain thing about the book: it is an exploration of the human nature that unabashedly exposes our darkest tendencies to savagery. That and the laws of civilisation that do not hold their effect in a place where rules and the idea of harmonious society do not apply. It’s a chilling tale that pushes us to reflect on the possibilities of living in a world where civilisation is removed, and we are left to our own devices to survive without order. Lord of the Flies narrates the unfortunate events following a plane crash on a small deserted island. The survivors, a group of well-brought up British boys ages six to twelve, find themselves in a hapless circumstance without the guidance of an adult. What could have been a haven for kids- frolicking by the beach and splashing in the waves- suddenly becomes a threatening place to exist for the boys who do not fully understand the implication of their condition yet. Without an adult to hold these boys together and impart the values, constraints, and conventions of a civilisation, the story becomes a struggle for dominance, order, and primal instincts. What was once a peaceful island devoid of savages becomes a war zone for the thirty or so English boys. Only the sight of the conch can gather these boys to order, but it’s becoming less effective as Jack realises its nonsensical purpose. From that point, only the slaughtering of pigs becomes a paramount importance to Jack. Due to a fateful turn of events, the group is divided into two factions: Jack Merridew’s choir boys who enjoy hunting and pyretic rituals and Ralph’s mostly young and refined lot who want to survive on the island in peace and keep the signal fire on top of the mountain from going out. Ralph, who knows less of everything but wants to govern by the rule of law, slowly loses his squadron as Jack lures them the into his group by offering the meat of their hunt. Only one person refuses to leave Ralph’s side and that is the clumsy but ever clever Piggy. Meanwhile, driven by his passions and anarchic leadership, Jack continues to terrorise Ralph and Piggy, enforcing his dominance over the nonviolent duo. Looting, treachery, and manslaughter are carried out without remorse as the majority of the boys succumb to their barbaric innocence. Lives are drained of blood and compassion is overridden by man’s inherent feral motivations. This goes to show that innocence has its ugly side when freed from society’s reasonable control. The end of innocence- this is what hit me deeply after reading the book. It’s a frightening realisation that represents a whole lot of things in this world. Lord of the Flies can be an allegorical commentary of the world’s political bodies; a religious metaphor between good and evil; a history of which man loomed in darkness before emerging from it through civilisation. But what’s striking the most is the new awareness that man might have been born naturally evil, but this only surfaces once the backbone of an organised social order has been taken away. There are several symbolism in the novel that readers are compelled to ponder upon for some time. For one, Ralph represents leadership and reasoning, who believes that the conch is the very symbol of law and order. Jack is the representation of man’s primordial instinct, who is driven to his innate nature of savagery in order to fend for himself- a sneak peek to what men were like before we learned to cultivate our ways. Simon depicts innocence and Piggy of compassion and intellect. But of course, all of these boys at the very beginning marvelled at their newfound freedom and indulged in wishful thinking that they might be saved by a passing ship, just before they entered a complex character arc. There’s the obvious sense of immediacy and tension in William Golding’s writing that take us into the unfathomable drama of the story. William Golding used the third-person view and crafted realistic speech patterns for the diverse characters in his story. For instance, Piggy, whose nerves betray him every now and then, speaks in abrupt bursts and unfinished sentences. The group’s default leader, Ralph, on the other hand, draws on short, imposing dialogues to get his point straight. William Golding fashioned the book with his stellar writing and imagery, having been able to describe the idyllic scenery and the splendid weather of the island well. Lord of the Flies is a gripping, suspense-riddled book not just for teenagers, but also for adults. There is much to take away from this adroit debut novel by William Golding. It’s intense, fast-paced narrative takes readers deep into man’s descent back to his primal roots. Although it leaves an unsettling trail in the end, it’s a book you would truly enjoy if you’ve come past all the gory details and the degree of insanity it presents.